There is precisely one Rhenish helm among all of England’s historic buildings, atop the tower of the Church of Saint Mary in Sompting, Sussex. Certainly, there must have been others, but this is the sole survivor. The distinctive form: four gables with a hipped roof above; a definitive feature of churches in the Rhineland, dating from the Romanesque. 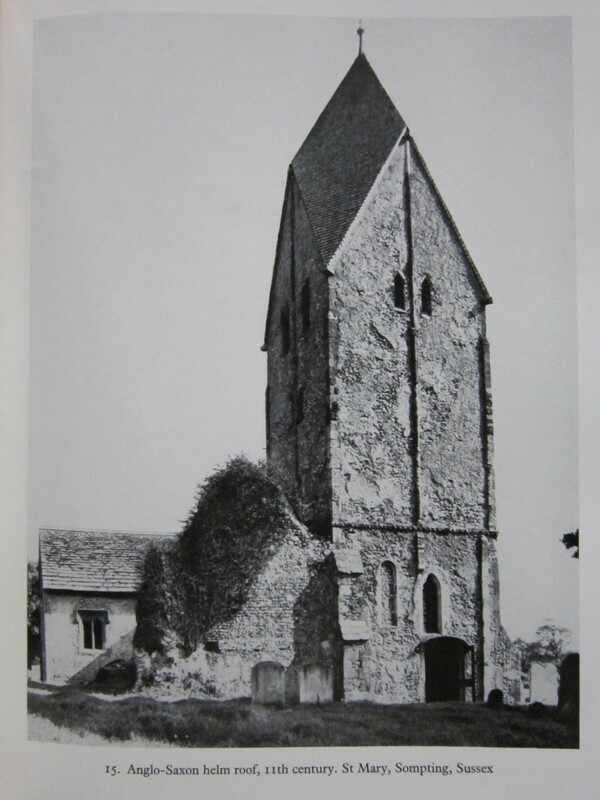 Cecil Hewett, in English Historic Carpentry (1980, Phillimore & Co. Ltd.), places the origin of Sompting’s tower ca.950-1050 CE ; more recent evidence indicates that the timbers are from the 14th century, when the church belonged to the Knights Hospitallers. Another authority, Cartwright, claimed that the tower was originally 25 feet higher, but was lowered during a late-18th century restoration. http://www.sussexparishchurches.org/content/view/45/33/ has a thorough description of the building and it’s history. It’s just possible that they are all correct. The form certainly existed as early as the 11th century, the 14th century timbers may have been replacements of originals, and there are taller versions of the Rhenish helm. Hewett’s drawings of Sompting are mostly of the core structure, and I have attempted to create a model based on his drawings, basic geometric proportion, and a fair amount of conjecture. 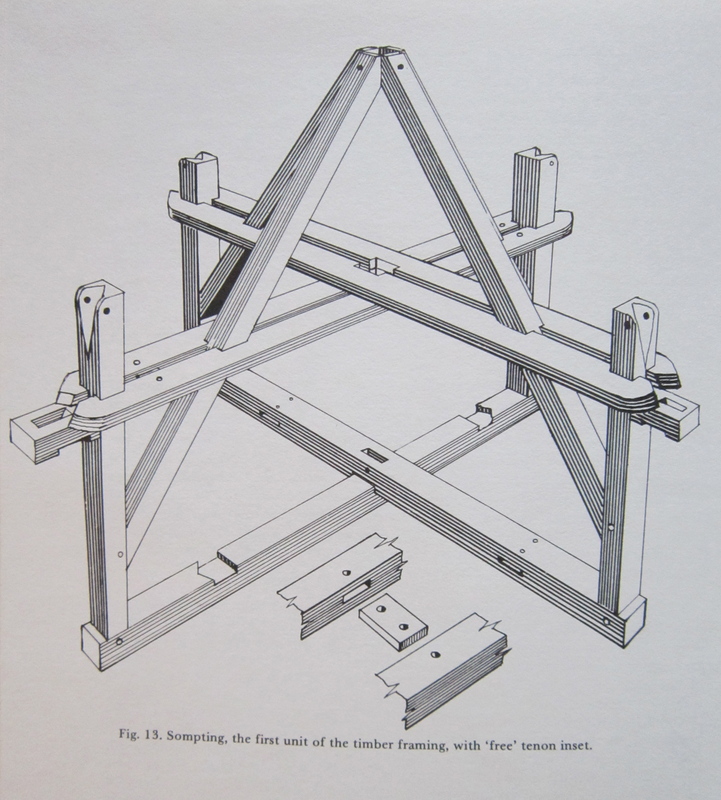 This is what Hewett shows of the structure: the crosstrees, king post, wall posts, rafters, purlins and braces. The core structure, showing joinery. And just for a sense of scale, from the back cover of English Historic Carpentry, a photo of Cecil Hewett standing on the cross tree. The study model. Note how the lower rafters join the feet of the upper rafters. 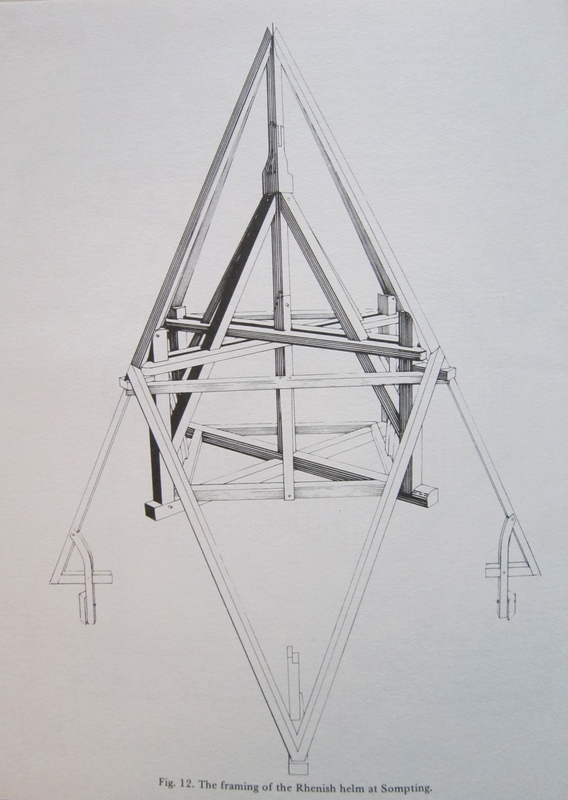 All the rafters must be on the diagonal axis, so that the upper planes fair with the roof plane, and the lower rafter cannot set above the plane of the upper rafter. This is substantially different from Hewett’s drawing, but the only way to effectively resolve the planes. 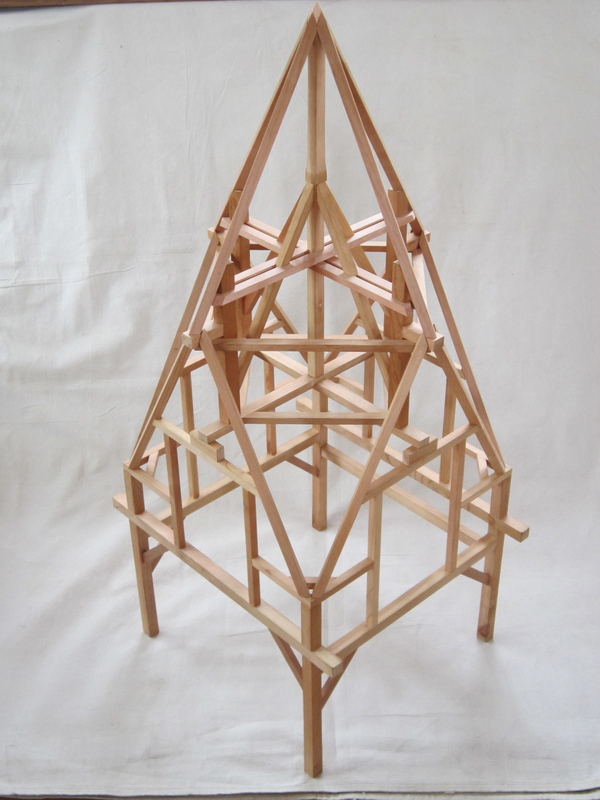 This model is 16″ x 16″ x 40″, intended as 1/12 scale. 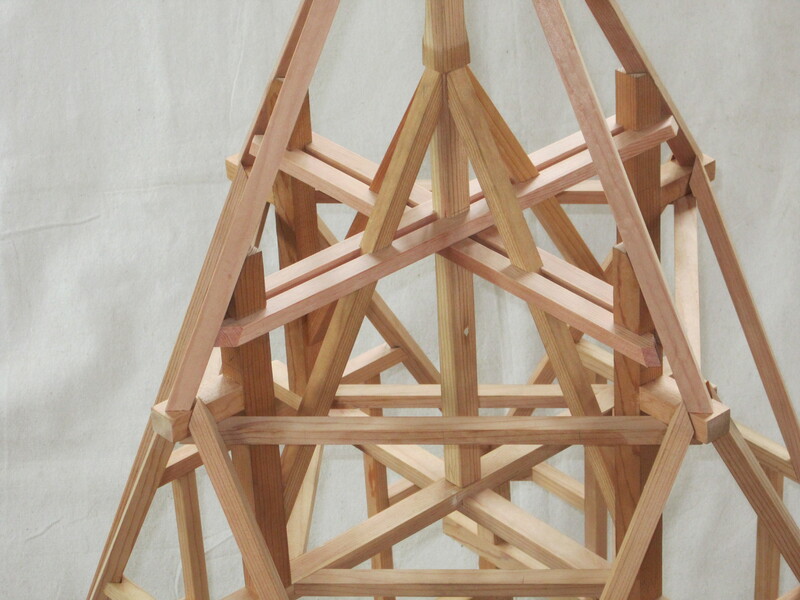 The materials are reclaimed Eastern white pine, ¾”x ¾”, ½”x ½” and ⅜”x ½”; scaled 8″x 8″, 6″x 6″ and 4″x 6″. From the photo, it is obvious that the Sompting timbers are considerably larger. 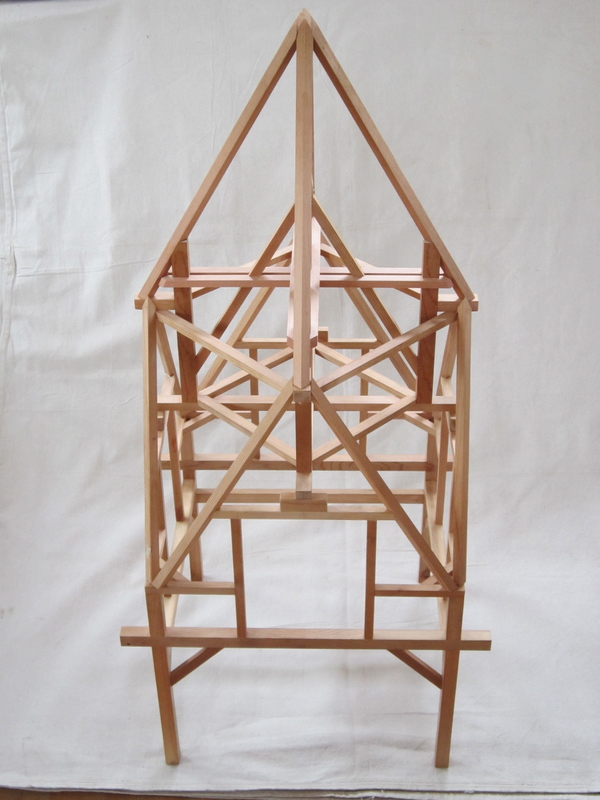 This entry was posted in architecture, carpentry, traditional building and tagged Cecil Hewett, England, Glossary of architecture, Sompting. Bookmark the permalink. Like a leaf of grass and one blade left standing! Wonderful model. I’m in awe of your skill and of what you did (do) Love that top B&W photo too. It’s amazing there’s just one such tower left in England. Or I don’t know, perhaps not because i never saw one there. Indeed when I first saw your picture, I just assumed the picture was from Germany! (or perhaps from Belgium/the Low Countries) Very nice bog. Thank you for the follow too. Am delighted to reciprocate. very best wishes. – Arran. I started reading about Kit Marlowe, Shakespeare, Boyle, and suddenly was caught up in Ireland’s struggle against English plantations. Great piece, I’m not sure that I finished but will be back for more. The Rhenish helm obviously originates in Germany, and there may have been many more before the conquest. 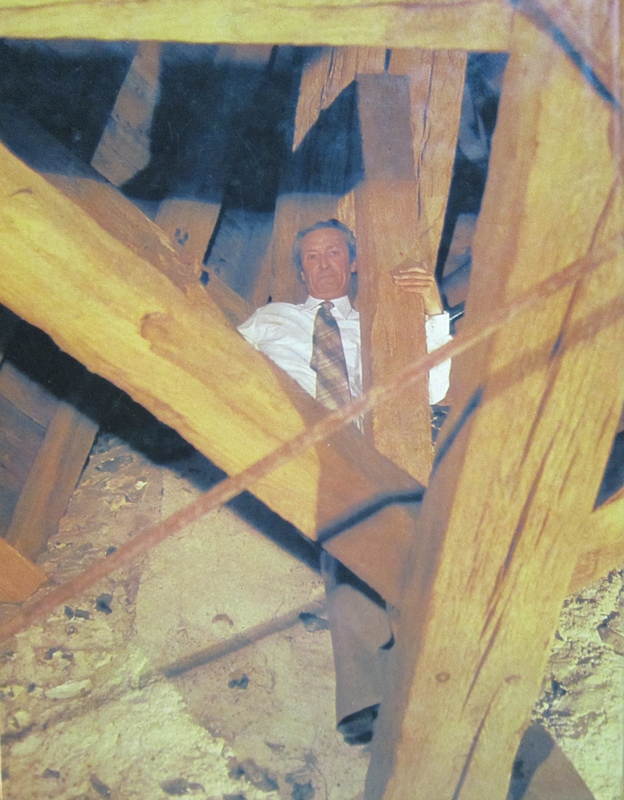 Interestingly, dendrochronology has recently dated the timbers to the 14th c. I can’t believe that Norman carpenters would have built that from whole cloth, they must be replacements of 11th c. originals. If you do a bit of research, the Rhenish helm at Sompting possiblyly dates to ca. 1000 CE. Gloucester, and several other Rhenish helms were built in the late 1800’s by Arts & Crafts architects. Most likely Grade II listed. European examples suggest that the form originated as Romanesque, probably as a practical solution to crossing gables.